E.D. Smith Lemon Spread, in the standard 500 mL jar. You know it. I know it. The best part of a lemon meringue pie is the lemon filling, not the meringue. The fluffy whipped egg whites are all dazzle, a distraction to draw attention away from the real action, which is hidden under the frothy waves of baked topping. 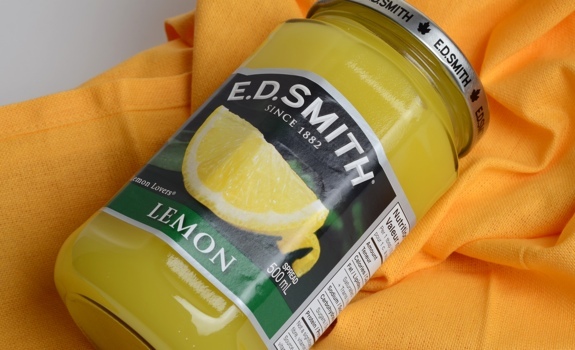 Young me had always wished there was a way to get pre-made lemon meringue pie filling without the pie, so it was with no small amount of delight that I spotted and bought a jar of E.D. Smith lemon spread a few years ago. Today’s lesson? Don’t chase a mouse unless you’ve figured out what you’re going to do with it once you’ve caught it. I tried the lemon spread once on a slice of toast (it was good), then ran out of ideas. The jar sat in my fridge for months until I finally admitted defeat and threw it out. It wasn’t a proud moment. So, having hopefully learned my lesson, I bought another jar, and figured I’d try finding some different ways to use it. The E.D. Smith website provides a few tips on uses, so I tried a couple of those, as well as some of my own. There’s a whole lot of lemon spread in each jar, so you’ve got to get creative if you don’t want any spread going to waste. In vanilla yogurt: It takes a bit of time to combine the lemon spread and the vanilla yogurt evenly, but man, is it ever worth it. As good or better than any lemon yogurt I’ve ever tasted. I probably used about three parts yogurt for one part lemon spread. Tinker until you find a ratio you like. In a sandwich with peanut butter: Nope. This doesn’t work. It’s not terrible, but it’s not good enough that I’d want to try this again. On a croissant: It’s OK. The flaky pastry of the croissant combined with the lemon spread yields an almost lemon-danish like taste. But it’s not as good as a lemon danish. Oh well. Would work in a pinch, though. Straight-up, by the spoonful: Smooth and velvety texture, but it lacks something when eaten on its own. The tartness is particularly apparent when there’s nothing else to mix with the lemon flavour. This is a situation where the difference between lemon meringue pie and E.D. Smith lemon spread seems particularly obvious. On a freshly baked, buttered scone: Nice. 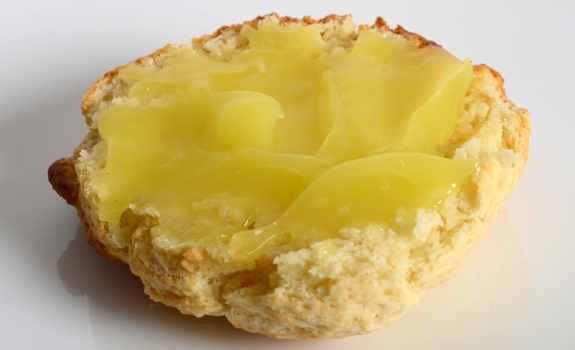 The lemon spread is thick enough that you can slather a deep layer of it on a scone. It’s not as sweet as a jam would be, so the lemon tang balances out the sweetness in the scone itself. I wouldn’t have it every time I make scones, but it’s a nice option to have. In a milkshake: Low-fat vanilla ice cream, meet lemon spread. Blend in a blender with a splash of milk, and serve with a straw. Result? Amazing. I wasn’t expecting it to be this good. Make sure you use enough of the lemon spread, or you won’t get the full lemony taste. Worth repeating. E.D. Smith Lemon Spread, applied generously to a freshly baked scone. Crazy good. Cost: $4.49 per 500 mL jar at the Co-Op in Andrew, Alberta. Similar prices elsewhere. Value for cash money: Good. One bottle should last you quite a while. Availability: More widespread than I initially thought. The more I looked for it, the more I found it. Nutrition? : 30 calories per tablespoon, which isn’t all that bad, as long as you don’t use 10 tablespoons of it in a milkshake. A very small amount of fat (0.5 grams), including 0.1 grams of trans-fat (0.1 grams), per tablespoon. There’s not a whole lot there, nutritionally speaking. Main ingredients: Water, corn syrup, sugar, modified corn starch, vegetable oil shortening, concentrated lemon juice … plus several others. The verdict: What did I learn from this experiment? That I’ll never need to let a jar of lemon spread go to waste ever again. I think my favourite way to have it was in the yogurt, followed by the scone, then by the milkshake. I’m sure I’ll keep experimenting with it in the future. If you like lemon, this is totally worthwhile. That fabric, when viewed on its own, is actually quite yellow. With the lemon spread to contrast, the cloth looks much darker. Curious. I live in the Netherlands and have not been able to find this lemon spread. While this particular spread might be hard to find in Holland, you could check a local UK import shop for lemon curd, which I gather (not totally sure, mind you) is similar. Failing that, there are loads of lemon curd recipes online you might want to try making. Good luck! I know they have it in Canada, if it helps. Do you think making a thick butter and icing sugar mixture and then adding this spread would work for a lemon cake filling? You can buy the lemon spread in Walmart and Loblaws that I know for sure. You can make your own in about 15 mins. with lemons, sugar, eggs butter. Google lemon curd recipe. Yum! That looks both tasty and easy to make. Thanks for the link! My husband bought this for me last night & I haven’t tried it yet. I sent him for that awful boxed pie filling you have to cook, but I’ve never seen anything like this before. (I’m in Alberta too) If it tastes half as good as it looks, I’ll be thrilled! I love lemon meringue pie & any kind of lemon filled pastries, but they are difficult to find, (pastries) & usually not that great. Tim Hortons hasn’t sold a lemon filled doughnut in YEARS. I wanted the filling to make my own pastries, & I may even attempt my OWN lemon meringue pie if the filling is good! Thanks for your review. It made me feel better about this product, (though I was pretty excited to begin with…lol) If any of my pastries or pie (if I’m brave enough) turn out well, I’ll be back to let you know. (& post recipes if you’d like) Thanks again. 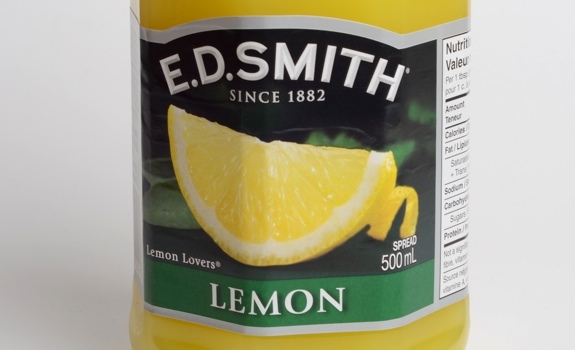 Advised, can get EDSmith lemon in Alberta. Ontario grocery stores cannot order . Canadian product, owned by American Company only available, purchase in US..Not surprised. Another Canadian product, company, bites the dust.